For some galleries, expanding to multiple locations is the mark of success. For Harry Hutchison, Director of Aicon Gallery, he found that just the opposite was true. Aicon Gallery, which specializes in modern and contemporary non-Western art, with a particular focus on South Asia, once had outposts in Palo Alto, California and in London, but Hutchison found that the best way to truly showcase their dynamic roster of artists was to pare down to a single, expertly curated permanent space, and to participate in multiple art fairs a year, expanding their program but not their physical footprint. By bringing together a variety of artists from regions of the world that are often underrepresented in New York, the gallery provides a platform for showing a more international vision of both modern and contemporary art. According to Hutchison, nearly ninety percent of the work the gallery shows is from India or Pakistan, though the gallery has recently expanded its purview to show more African Art as well. In addition to mounting solo shows by the gallery’s artists, Aicon exhibits curated group shows that illustrate the depth and scope of the gallery’s program and ambition. Shows like Readymade: Contemporary Art from Bangladesh, which was the first-ever extensive survey exhibition of contemporary Bangladeshi art held in New York and Between Structure and Matter: Other Minimal Futures, which explored overlooked historical bodies of work by Rasheed Araeen and Somnath Hore to expand the discourse around minimalism, speak to the galleries ambition, and the way they are paving the road for a more serious discussion on non-Western art in the U.S.
With the ability to focus on one gallery space, Aicon Gallery is now able to participate in roughly ten art fairs a year, and to bring that far-reaching vision to audiences around the world. For the gallery, If So, What? offers the chance to revisit its California roots, and to catch up with old friends and new collectors alike. Hutchison feels that the Bay Area is an important hub with an expanding collector base that resonates with the gallery’s program. To help appeal to the diverse Bay Area audience, Hutchison says that gallery is planning to bring a selection of works by a variety of artists, including Rachid Koraichi, Surendran Nair, S H Raza, and Anil Revri to the first If So, What? event. This selection reflects the gallery’s pioneering program, and highlights the way they have helped to create a U.S. market for these audiences. It was Aicon Gallery that gave Rachid Koraichi – who had been shown internationally for decades – his first New York solo exhibition in 2016, which was widely acclaimed. Koraichi comes from a family of Quranic scholars and was first trained as a calligraphist. As the New York Times describes it, he “has made the written word, as a conveyor of spiritual philosophy, poetry and politics, his primary medium.” The works that Aicon Gallery will show at If So, What? feature Koraichi’s calligraphic expertise and his work in various mediums, including bronze, porcelain, and paintings on canvas. The gallery will bring a mix of masterworks, along with contemporary artists working today. Among the historical highlights will be works by S H Raza, a legendary Indian artist who was revered for his spiritual modernism. 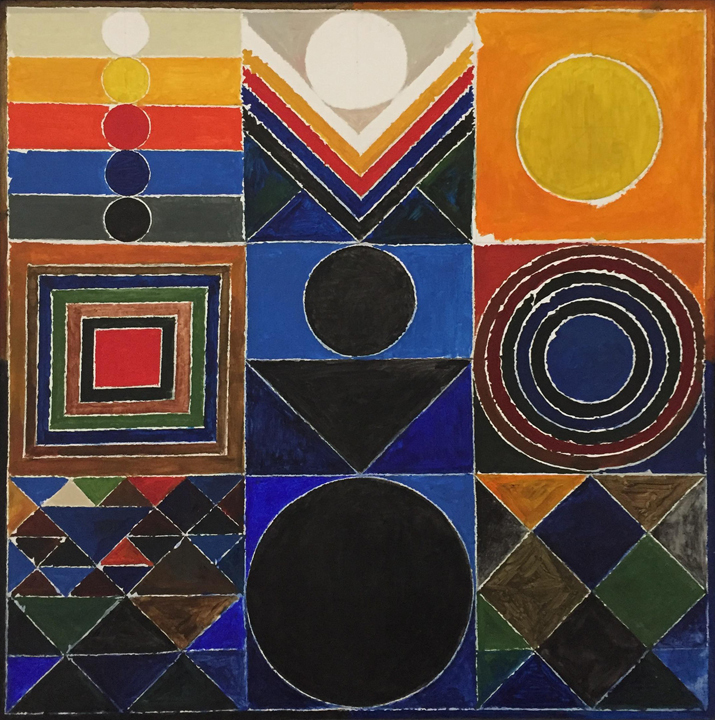 Aicon will bring a selection of Raza’s vibrantly colored works, including an example of the artist’s geometric paintings from the artist, which Hutchison feels will appeal to Bay Area audiences.